Keeping this year’s decline in the 5% range required a massive fourth quarter full court press on the consumer. (As late as 9/5/10 country was behind 13.2%.) 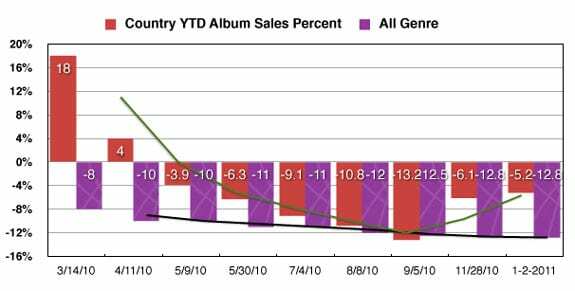 The ten Top Selling Q4 Country CD releases shown in the colorful graph [above] show how much superstar product was launched into the marketplace. 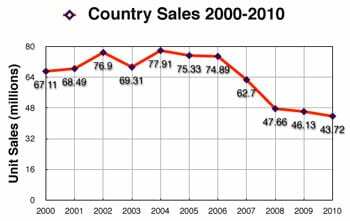 The Sales Percent graph [top] shows how the numbers (and consumers) responded. Six artists were able to shift more than a half million units each in the 15 week (or less) holiday season leading to year end. Lady Antebellum’s Need You Now also must be mentioned. Although the trio debuted 49 weeks earlier this year and therefore didn’t make our Q4 chart, they racked up 3.09 million units YTD. Taylor Swift’s spotlight continued to shine brightly this year, eclipsing all but a very few other artists worldwide. Her 1.05 million unit Speak Now debut week (10/31) exploded and she ended the year selling just shy of 3 million units over a 10 week period. The colorful Q4 graph tells the tale and explains why the young singer/songwriter continues to reap large editorial coverage. As we wonder about 2011, insiders project that retail shelf space will continue to shrink, and marketers will therefore continue to place a premium on prospecting for new sales opportunities.